Braamfontein Alive: Power of a woman: Celebrating the Obamas. Power of a woman: Celebrating the Obamas. 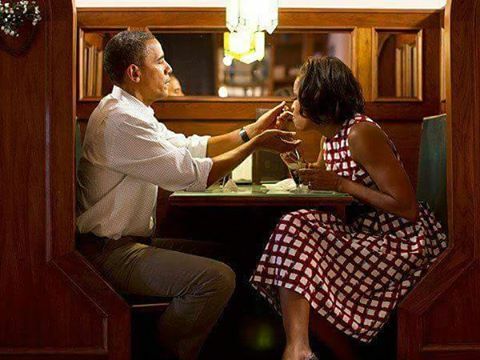 One night President Obama and his wife Michelle decided to do something out of routine and go for a casual dinner at a restaurant that wasn’t too luxurious. When they were seated, the owner of the restaurant asked the President’s secret service if he could please speak to the First Lady in private. They obliged and Michelle had a conversation with the owner. Following this conversation, President Obama asked Michelle, “Why was he so interested in talking to you?" She mentioned that in her teenage years, he had been madly in love with her. Believe it or not, sometimes it's a woman that makes a man who he is! So for the single men that are still searching for a wife, may God help you to find that help mate that will turn you from "a nobody" into "a somebody". For that single lady that is reading this, may you be that blessing no man can do without. Adapted by Olagunju, Success Taiwo.